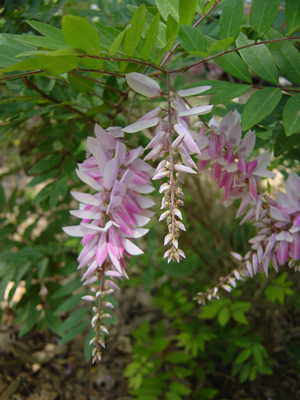 Indigofera is native to China, Japan and Korea and has alternate, compound pinnate leaves that are typical of the Leguminacea family. Indigofera kirilowii has a continuous show of pendulous rose-pink racemes all summer long. This plant will grow to be a small shrub, getting 30″ tall and 36″ wide, and is good for shade gardens under tree. Indigofera does well in calcareous soils and is sometimes used as an upright groundcover.